Activating space by occupying a large wall or a room with multiples (a single work of art comprised of repeating elements) are challenges I have enjoyed exploring over the years. Textiles have an ancient history of holding deep intimacies in the warp and weft of their construction. They can also cartwheel into large monuments. I believe that some ideas need light pouring through them. Working in pojagi (Korean patchwork) has allowed me to play with the architecture of light and line while collaborating with words, images, and other artists. 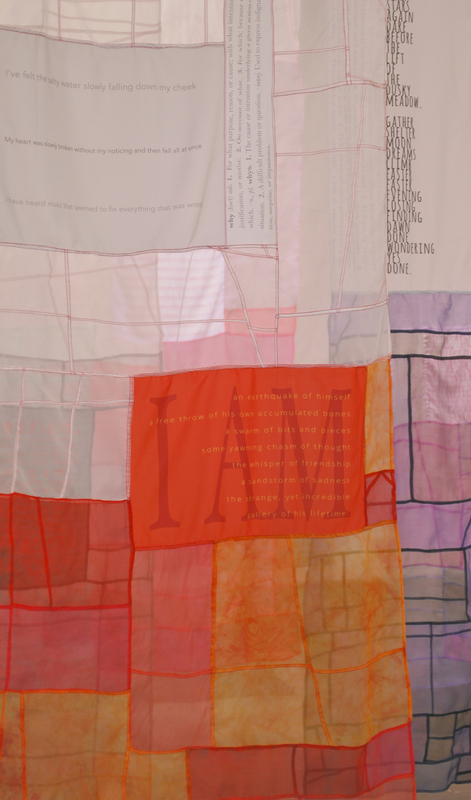 Making a 24 foot-long book, totems, and silk strings holding tiny collages are other efforts that seek to reveal evidence of our collective vitality. 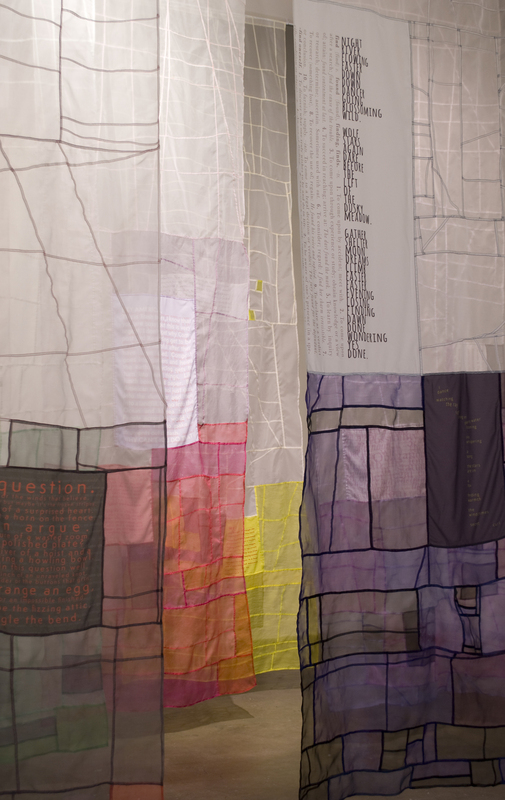 Just Write (2015) is a textile collage installation in ten panels, 42 x 132 inches each, with silk organza, digitally printed text on polyester, and pojogi stitched. The text was developed in a creative writing residency with Carolina Friends Middle School students in North Carolina. 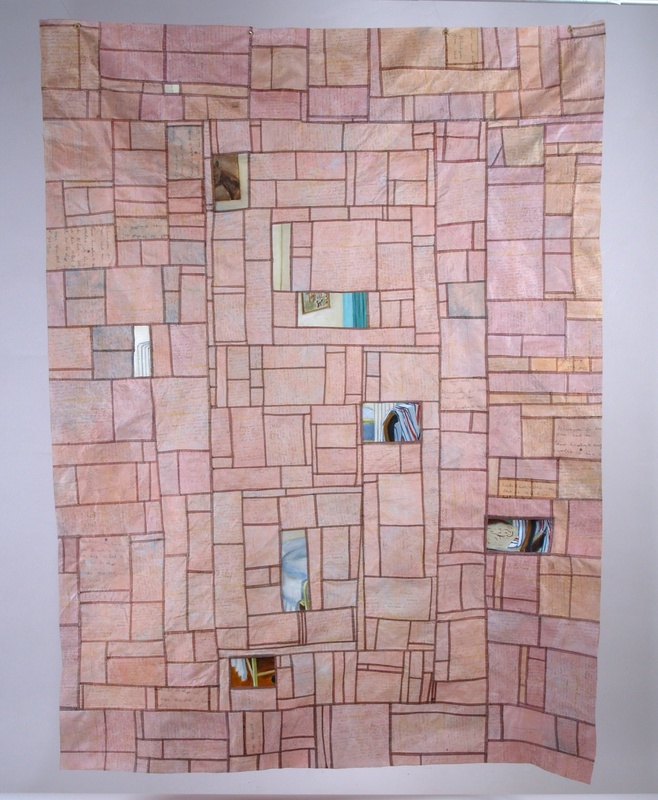 China Silk (2012) is a textile collage installation in nine panels, 108 x 42 inches each, created with photo collage from Barbara Tyroler's China series, digitally printed on china silk organza, and pojogi stitched. 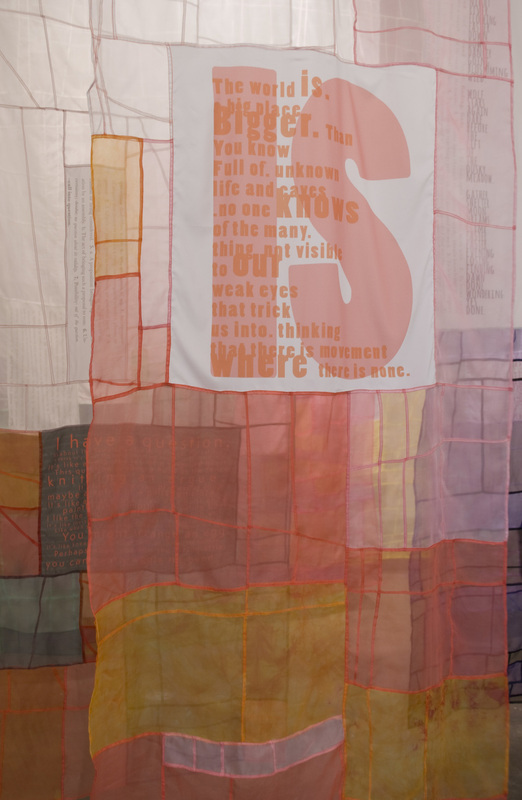 French Letters (2007) is a textile collage installation in three panels, 78 x 60 inches each, with vintage family letters printed on silk organza, repurposed paintings (oil on linen), pojogi stitched. 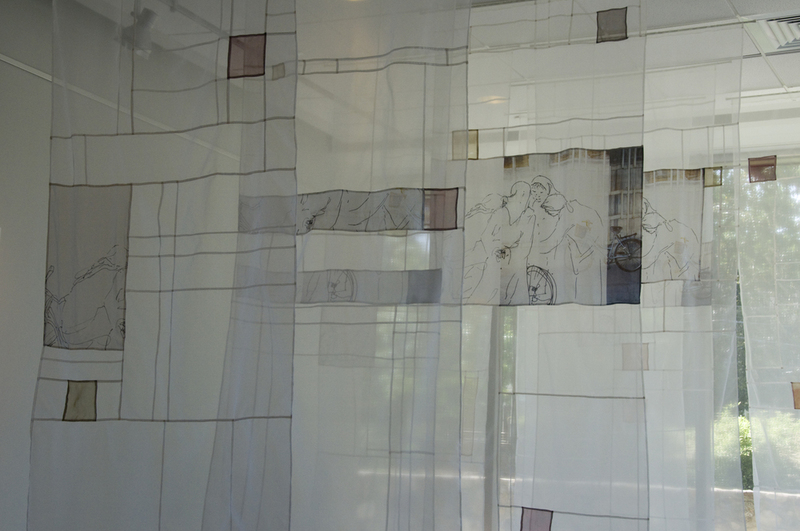 Nuptial Wall (2008) is a textile collage installation, 90 x 46 inches, with silk organza, vintage clothing & lace, textile ink, pojogi stitched. 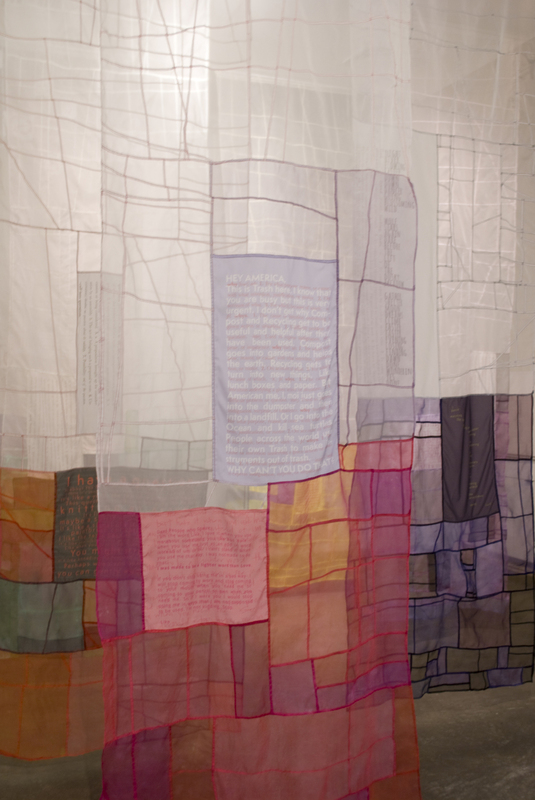 Big Green (2011) is a textile collage installation, 84 x 60 inches (2 inches deep) with linen, cotton, silk, hand stitched, and strung with silk thread. 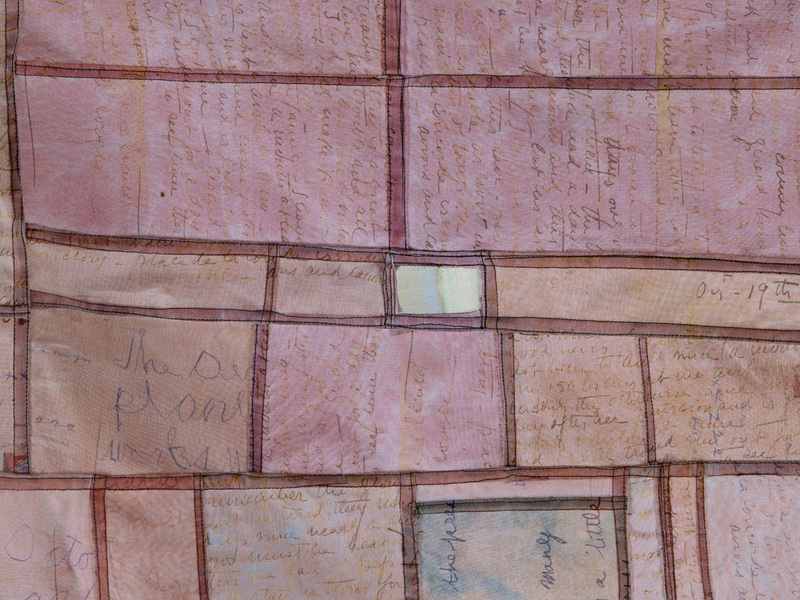 Open Book (2010) is a mixed media installation (elongated wall mounted book) in four panels, 7 x 72 inches each (3 inches deep), with serigraphy on canvas, assorted papers, photos, touch drawings, vintage materials, machine stitched. 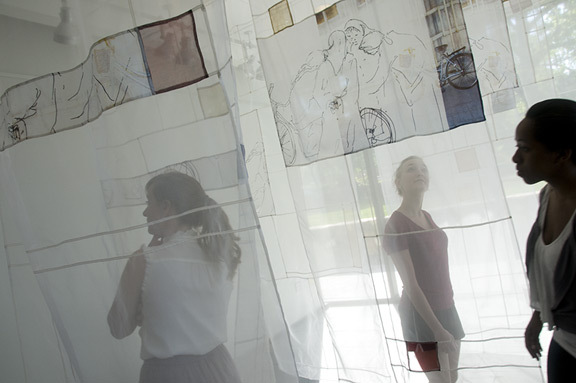 Gathering Blue (2005) is a textile sculpture in nine sculptural elements, 60 x 4 inches each (approximately), with hand dyed silk organza, vintage damask linens, paint, machine stitched, wire mesh armature support.